Grew up… who knows? He’s a demon who’s lived for thousands of years. Living… in the Phantomhive estate in England. 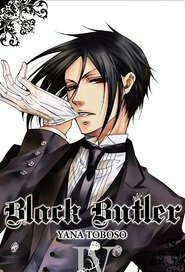 Sebastian serves as butler to the Earl Ciel Phantomhive, and it’s because of Sebastian that the house and grounds are simply impeccable. It’s also because of him that the three other servants haven’t managed to burn the place down yet. Interests… accomplishing the skills of a butler with effortless finesse. The perfect pairing of tea to cake, the elegance of the correct table setting – these are sources of satisfaction. Although nothing can quite compare to the elegance and beauty of cats, which are the only things that can distract Sebastian from his duties. Relationship Status… single. Serving his master Ciel doesn’t leave him much time for romantic pursuits. He’s not above using a dazzling smile to get his way, though. Challenge… helping Ciel achieve his goal of avenging his parents’ murder. And when Ciel accomplishes it, Sebastian will devour his soul. That’s the deal. Personality… graceful, accomplished, and practically perfect. Sebastian embodies the soul of gentility. He’s a lover of beauty, and can even be a little fussy sometimes. But make no mistake: underneath the polite exterior, he is still a demon, and perfectly willing (maybe even eager) to kill on command. It’s possible, though, that he has some human emotion – he does seem awfully devoted to Ciel. Sebastien Michaelis's popularity ranking on CharacTour is #255 out of 5,000+ characters. See our top-ranked characters and read their profiles.